The headless horseman is an adventure edited by Mount Parnassus Games, one of the last ones to join the 3rd party wild bunch. Oliver Korpilla, who I suspect is the man behind the publishing house, is the author; several artists contributed with illustrations. According to the credits page, this module also makes use of the Effect Engine system, borrowed from Mindjammer press, but I'm not sure where; it's true that the monsters and encounters are described following a curious and clear structure, maybe that's the aforementioned system. My masters don't own any book by that publisher, I'm afraid. As the title insinuates, the adventurers will face the legendary headless horseman while they're passing through a small village. The first part of the adventure is a murder mystery, plus an abduction case. The hook, then, will probably be either "please find my daughter" or "hunt the abomination that killed my son" in exchange for some gold (I can't understand that human love for gold... give me written paper any day of the week). The second part is a "seek and destroy" mission, with a final twist. The forest where this part takes place is outlined through a series of resources (encounters, places, monsters) rather than with a map, called a "living map". It's a clever way of showing a changing and mysterious environment. The whole adventure is outlined in a very concise and structured way, with shadowed text boxes that remark the essential clues or NPCs. That's great; modules are usually a mess, full of information but badly distributed. It's also greatly written and narrated. Both the theme and atmosphere makes this adventure a perfect match for Transylvanian adventures, the gothic setting for DCC RPG, and also for the incoming Halloween celebration (it can maybe be squeezed in a one-session game). 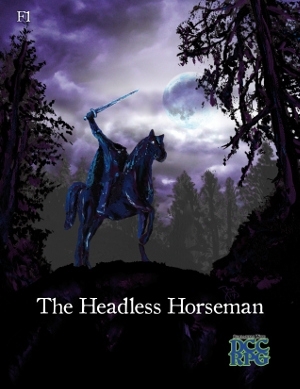 The headless horseman is a powerful icon, and there's actually a great picture of it in the book. 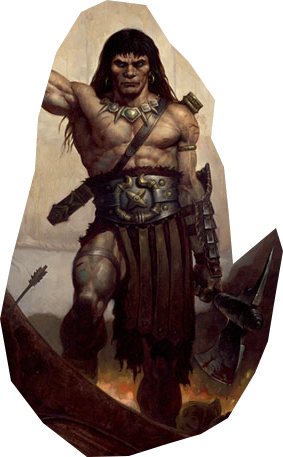 This is a Pirate Conan (3 out of 4) module. Don't get me wrong, it's a very good adventure, but I'm a being of sword&sorcery.